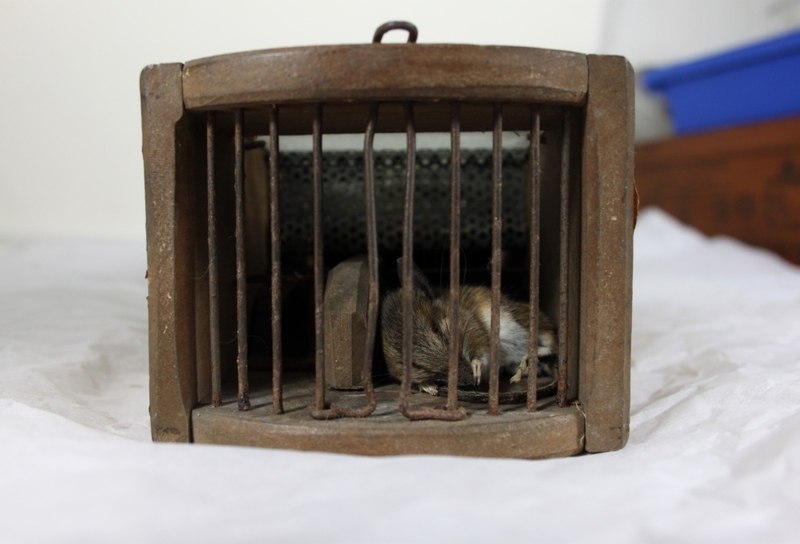 It all started with a story that, five or ten years ago, would have remained within the four walls of the museum and gone no further: our assistant curator found a dead mouse in a Victorian mouse trap. The trap was behind a glass case in our store; it was not baited and it was not on display. And out of the thousands of tasty objects the mouse could have chosen to call both home and dinner, it zoned in on one of the few objects designed to kill it. 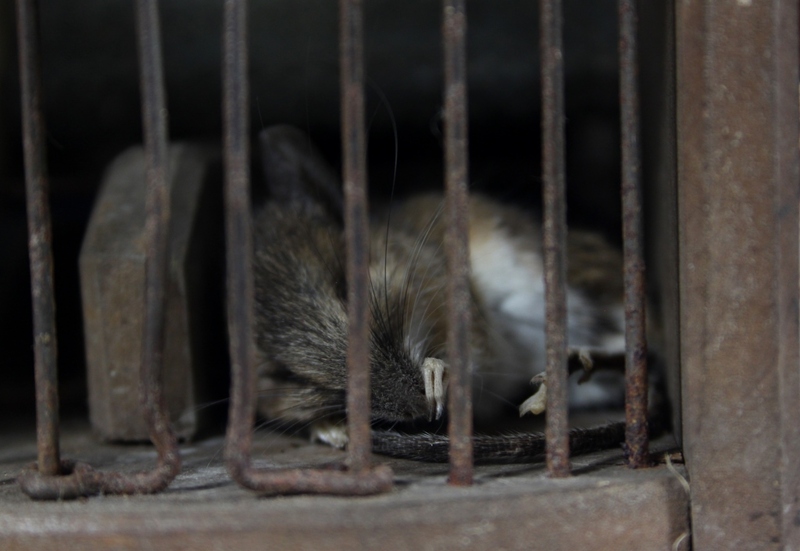 As a humane trap, the mouse is meant to be found and then released. Tragically, our mouse would have died a lonely death. 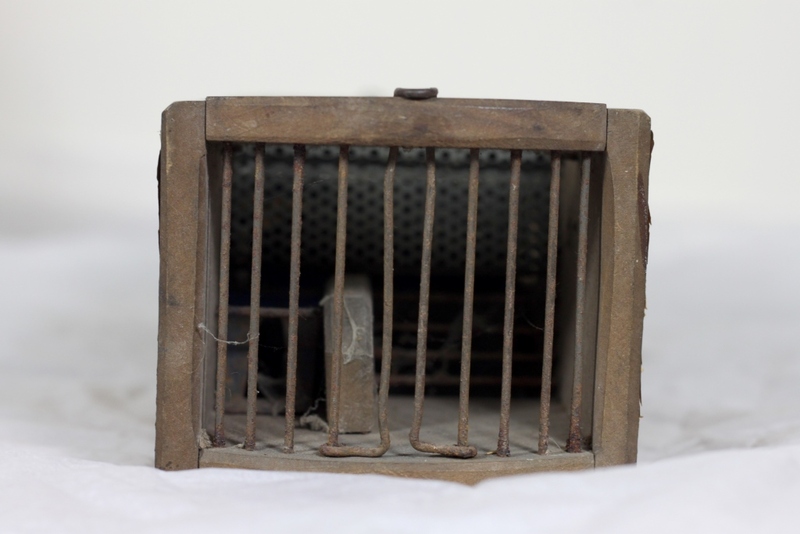 Since we check our collection for pests regularly, and don’t expect our traps to be achieving their original purpose, this mouse was simply unlucky to get trapped in a time-frame between check-ups. We thought the story was interesting and posted about it on our blog and Tumblr. Fast forward five days and it has become global, viral news. See our other blog post for more information about the trap and an update on what we’re doing with the mouse. 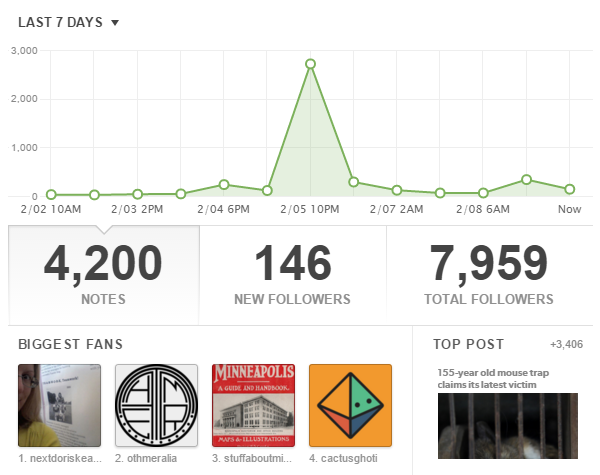 Interest in our Tumblr spiked, and then rapidly returned to normal levels. Since the original blog post, we have been interviewed by the BBC and the Canadian public radio broadcaster CBC. 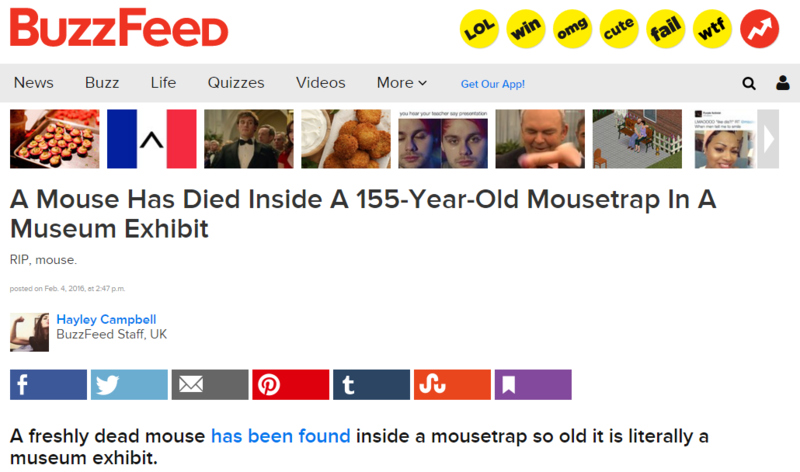 After featuring on BuzzFeed the story of our mouse rippled throughout the internet, ending up on The Daily Mail website, ABC, The Huffington Post, I F***ing Love Science and more. We trended on Tumblr, where our post has over 3,000 notes, and have been chosen as a feature of their History Spotlight category. We made the front page of Reddit, and our imgur gallery has been viewed 374,552 times. Our blog has had 67,521 views since the original post, more than the past two years put together. Not bad for our BuzzFeed debut. Suffice to say, we’ve never had it so good on Facebook. As more and more websites picked up the story we were also featured on various Facebook pages. As pages such as I F***ing Love Science shared the story, the MERL Mouse was suddenly trending across the world. 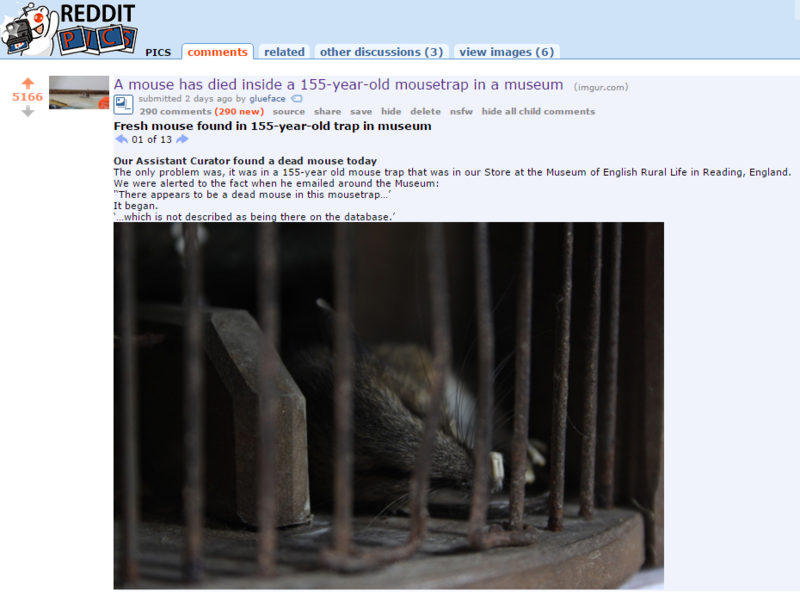 Our mouse made the ‘front page of the internet’, better known as Reddit. Needless to say, there does not seem to be one recipe for going viral. What seems essential, however, is recognising when you have a good story, writing it well and having nice pictures. From there it took getting our story in front of the right person – in this case Buzzfeed’s Hayley Campbell – and then watching the dominoes of ‘clickbait’ websites fall. We also nudged the story along, soliciting a retweet from a ‘power user’ of Twitter and Tumblr, Neil Gaiman, as well as posting updates and providing different angles on the story, such as our image gallery on Reddit. We were lucky that we had been building our expertise and capacity in social media for some years, meaning we could hit the ground running when it became obvious the story was a hit. Our online network of museum professionals and journalists was essential to its success; without Nick Booth alerting Hayley Campbell to the story, it may not have kicked off in the first place. 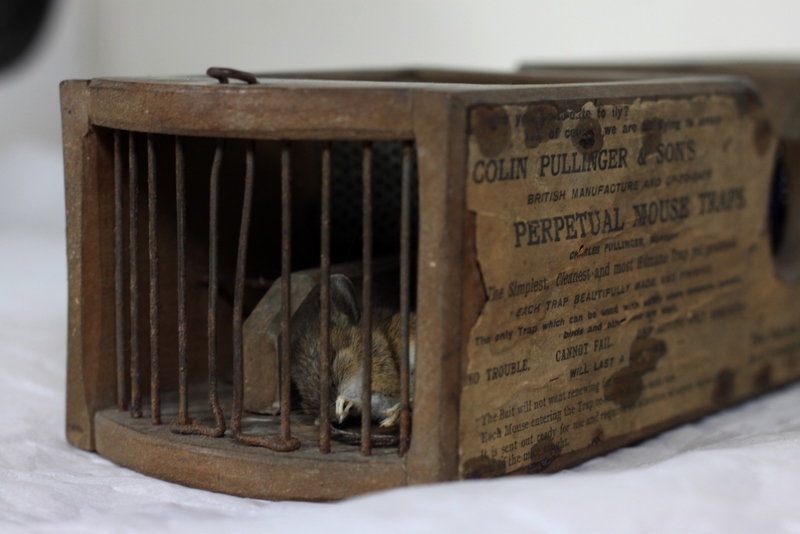 However, before we publish blogs from now on, we’ll definitely be asking ourselves: ‘Would we be happy if this went viral?’ In hindsight, we were glad to have explained the ethical and practical issues involved with having a dead mouse in a museum object, as well as why and how it may have happened. Trust is very important to a museum, and if this story had gone viral without us considering the deeper issues we may have suffered immense damage to our reputation. There are many other stories about the important work we do as a Museum which we’d preferred to have gone viral, but nevertheless we hope those who saw the story have learnt a bit more about conservation, the continuing relevance of museum objects and how even the smallest of tragedies can captivate the world. 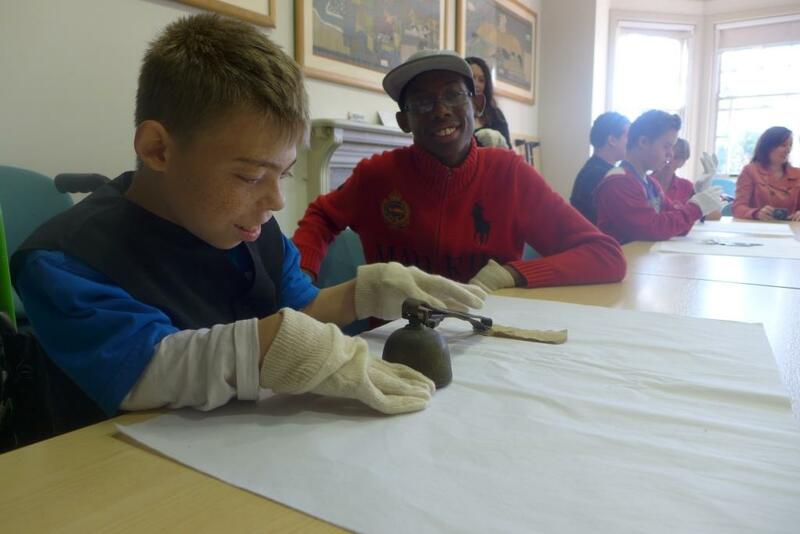 Last term the museum welcomed a group of Further Education (FE) students from The Addington School in Woodley. They came to the museum to find out what it is like to work in a museum as part of their Transitions Workplace Training. Other businesses that have shown Addington students around their world of work include Reading Buses and Reading Fire Station, so we had a lot to live up to. 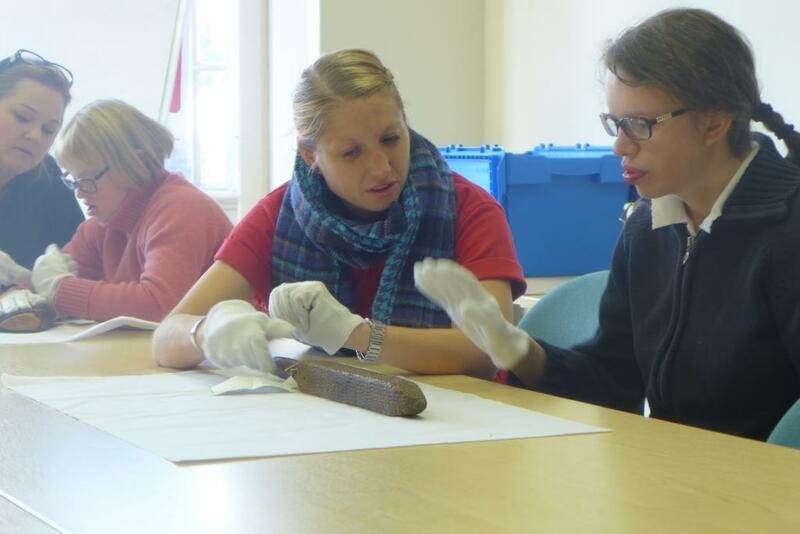 The objective of the session was that the students would go away with knowledge of the purpose of museums, an understanding of what we do at The Museum of English Rural Life and having had a chance to actually handle some museum objects and guess what they were. The day started with a quick brainstorm of what the group already knew about museums, with us asking questions such as ‘What is a museum?’, ‘What do you find in a museum?’, ‘Who works in a museum?’ and ‘Who visits museums?’. The answers we got were hugely varied ranging from “old people go to museums” to “at a museum you find things on the walls”. 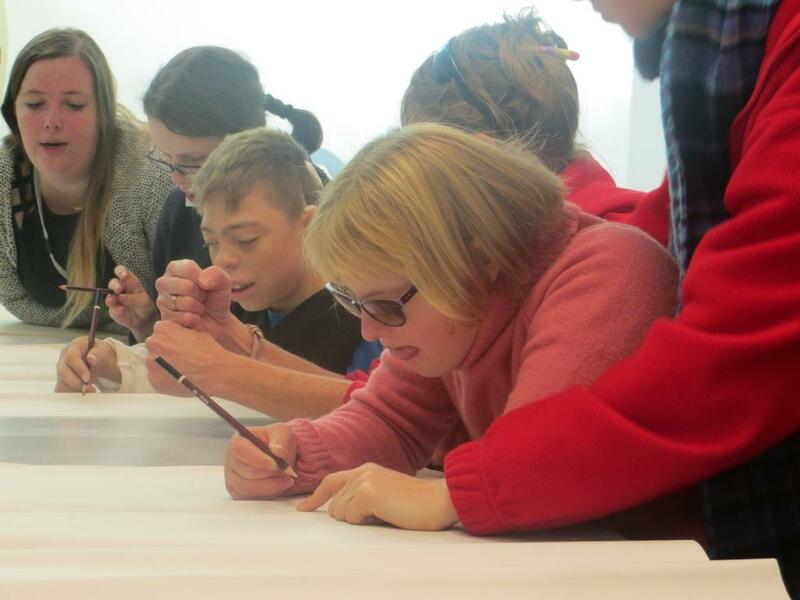 Some of our particular favourite comments about museums were that they are “special” and “magical” places, “that they are for everyone” and also we saw a statement that “museums are boring” as a personal challenge to prove them wrong! After establishing general information about museums we enjoyed taking the group on a special behind the scenes tour of the building. First we had a look at the gallery space; confirming someone’s earlier comment that museums are big places by seeing the open space we have whilst the museum is being redeveloped. Next came a trip up to the mezzanine level where the students got their first glimpse of some of the objects they would be handling later on. Guessing what different corn dollies represented was a particular hit, as was a procession past all of the tools hung on the mezzanine wall. Once the students had seen some (actually hundreds) of objects it was time for a rundown of how to handle them. The group put themselves into the mind-set of a curator who had been given a set of objects that they had to identify using sight, sound, smell and most importantly touch. Some objects were harder to identity than others; a Strickle (a tool used to sharpen scythes) and a Polehead from 1700s, testing the students curatorial powers the most. It was wonderful to see the real respect the group had for the objects, even under the extremely tempting circumstance of being told not to ring a sheep bell! We had a marvellous day with the students and it was a joy to introduce them to the world of museums. We hope that they went away with a new appreciation of museums and the type of work that goes on within them, as well as some changed minds about whether or not museums are boring! 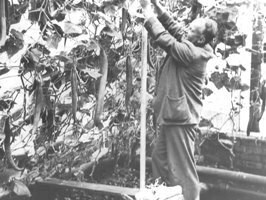 One of our recently catalogued collections is a set of 41 farm diaries belonging to the Beale Family of River Hall Farm, Biddenden, Kent. 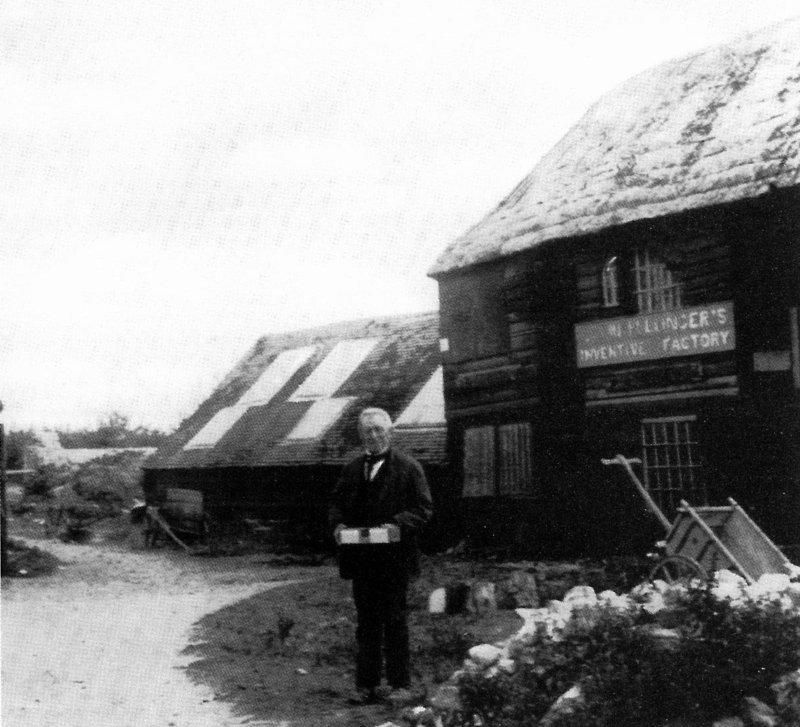 The diaries document the daily lives of Richard Beale Snr and Richard Beale Jnr during the years 1791 until 1834. 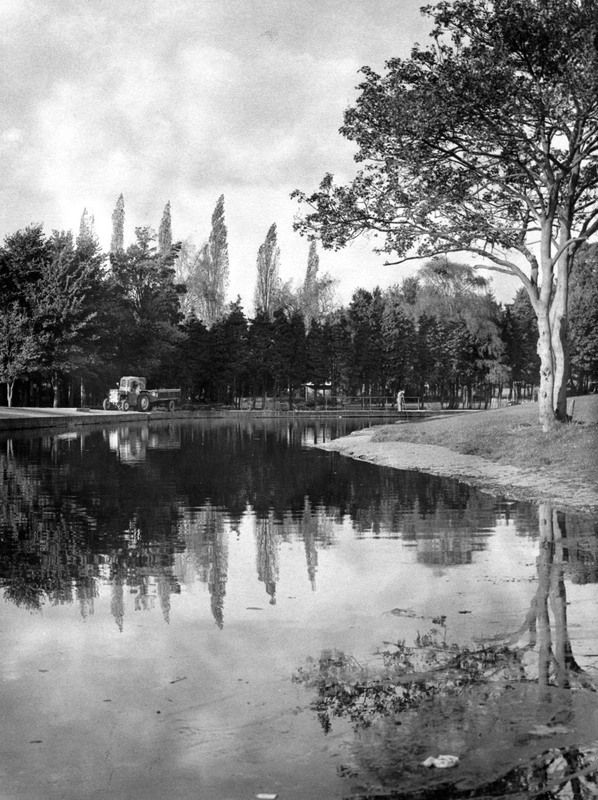 Richard Beale Snr was born in 1744, he never married and when he died in 1814, he left his estate to his nephew Richard Beale, the son of his brother Seaman Cooke Beale, of London. 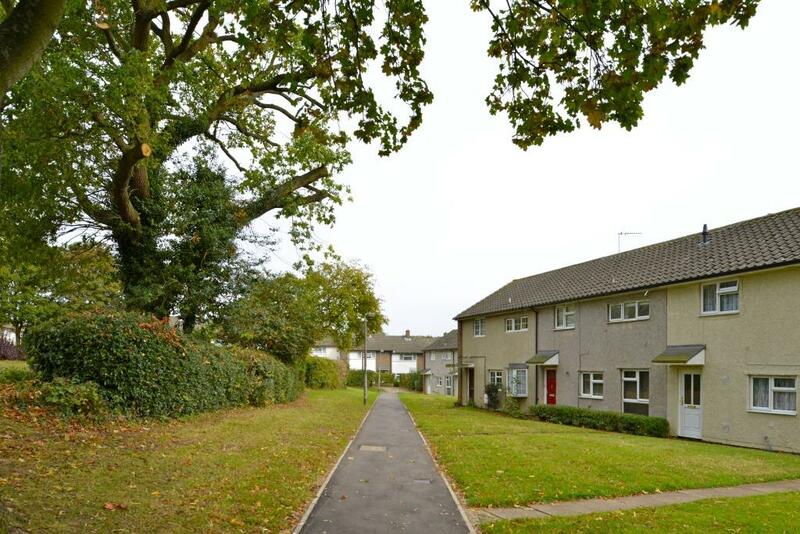 Richard Beale Jnr was born in 1771 and by his death in 1836 he had a large family, some of whose descendants continued to live in Biddenden until the 1960s. Verses of an untitled poem found in one of the diaries. 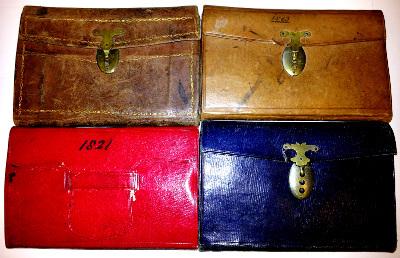 The diaries are small pocket notebooks bound in all different colours of leather mainly red but also brown and blue, they have a metal latch or ribbon tie to keep them closed due to the fact that many of them have pockets in the covers which had contained notes, correspondence and all manner of bits and pieces. To preserve these extra items contained in the diaries they have been flattened and placed in archival envelopes to ensure their survival. books; daily totals are meticulously recorded and many of the loose papers include itemised bills and receipts from suppliers and customers. There are some tantalising clues as to the identity of some of the farm workers with their names and pay recorded in both diary entries and on the loose items. 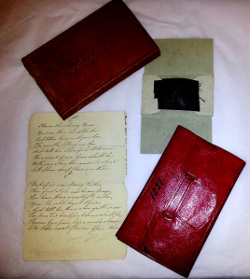 Some of the more unexpected items found in the diaries include a couple of home remedies to cure animal diseases, verses of an untitled poem, a piece of felt with a line of sewing on it, a small sample of black material and a brown leaf folded amongst a set of accounts. 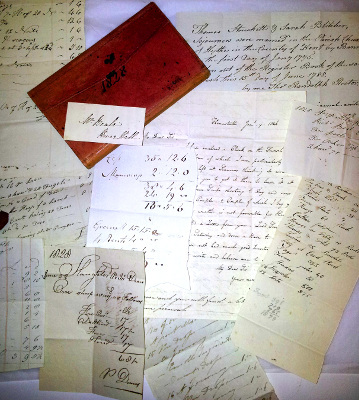 The catalogue of these farm diaries will soon be available to view on our online catalogue under the reference FR DX2147. So, this retired rodent had managed to sneak past University of Reading security, exterior doors and Museum staff, and clambered its way up into our Store. 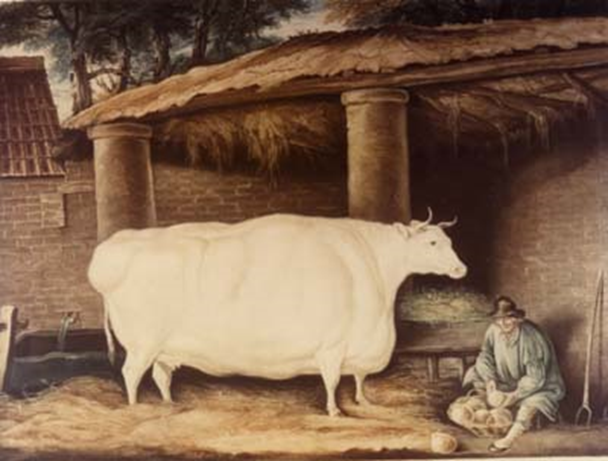 Upon finding itself there it would have found the promised land; a mouse paradise laid before it full of straw, wood and textiles. Then, out of thousands of objects, it chose for its home the very thing designed to kill it some 150 years ago: a mouse trap. The trap itself was not baited, but this did not stop our mouse from wriggling inside and, finding itself trapped, meet its demise. 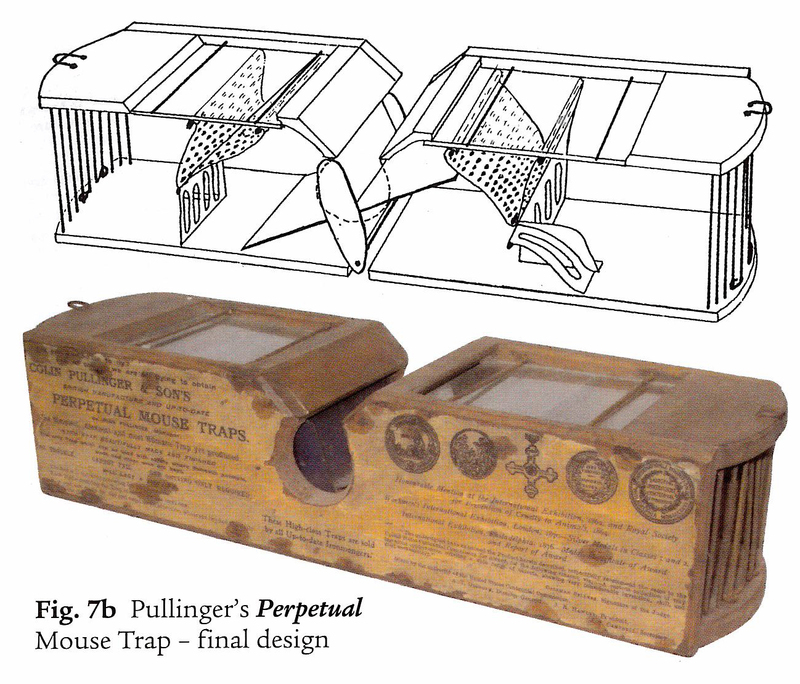 The trap was manufactured by Colin Pullinger & Sons of Silsey, West Sussex and although we don’t know the exact date this one was made, the trap itself was patented in 1861. 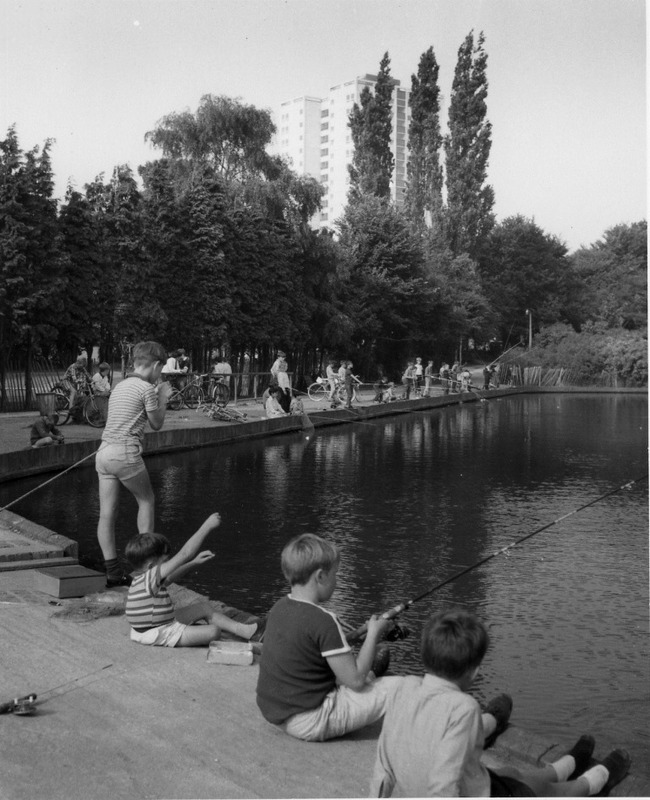 It is a multi-catch trap with a see-saw mechanism, and you can see its object record here. It is known as a ‘Perpetual Mouse Trap’ and proudly declares that it ‘will last a lifetime’. How apt. 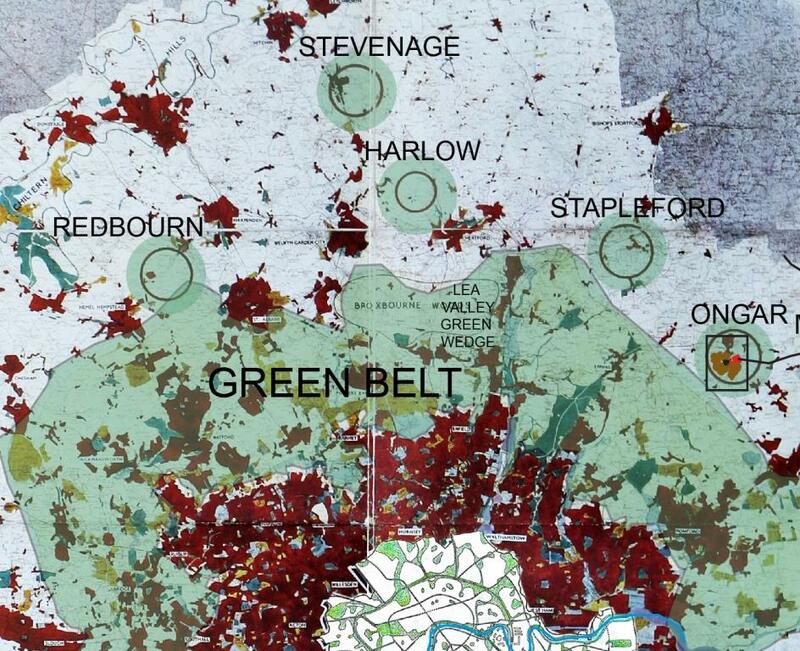 The trap is described as ‘Perpetual’ and it certainly is that. Pests are, of course, a perpetual menace in any museum. 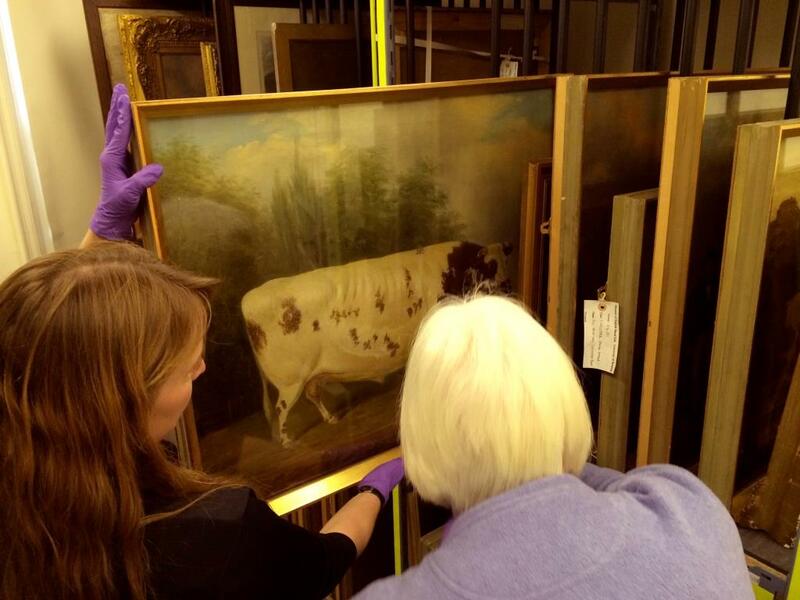 Curators and conservators are always alert for the tell-tale signs of moths, beetles and rodents which feast on the organic materials we hold in store. 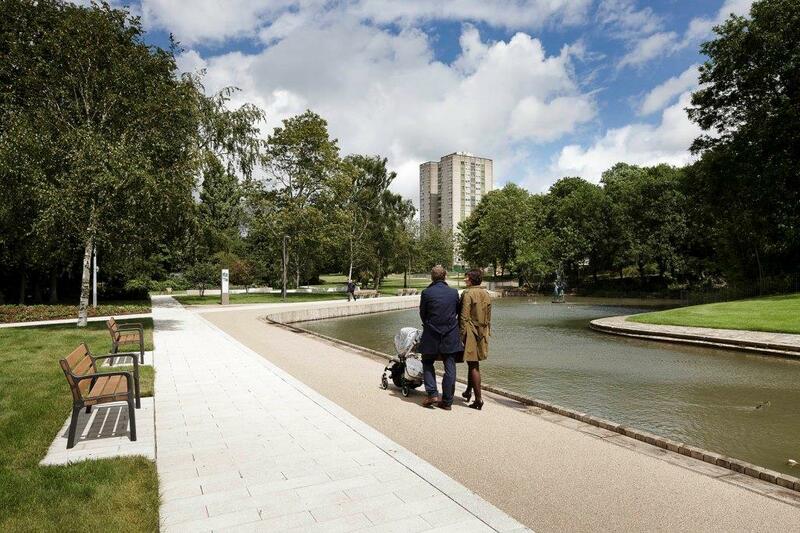 Hygiene and regular cleaning are a first line of defence, as are glazed cases. 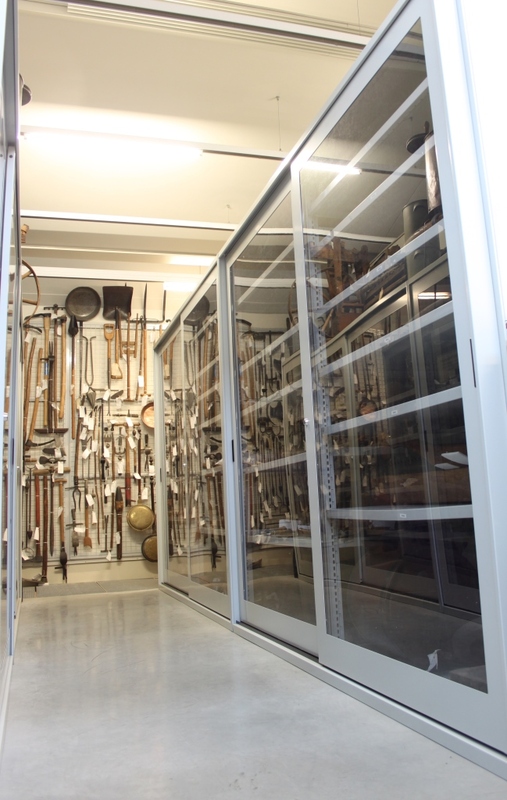 Objects are also treated before storage or display to ensure anything lurking within is killed. 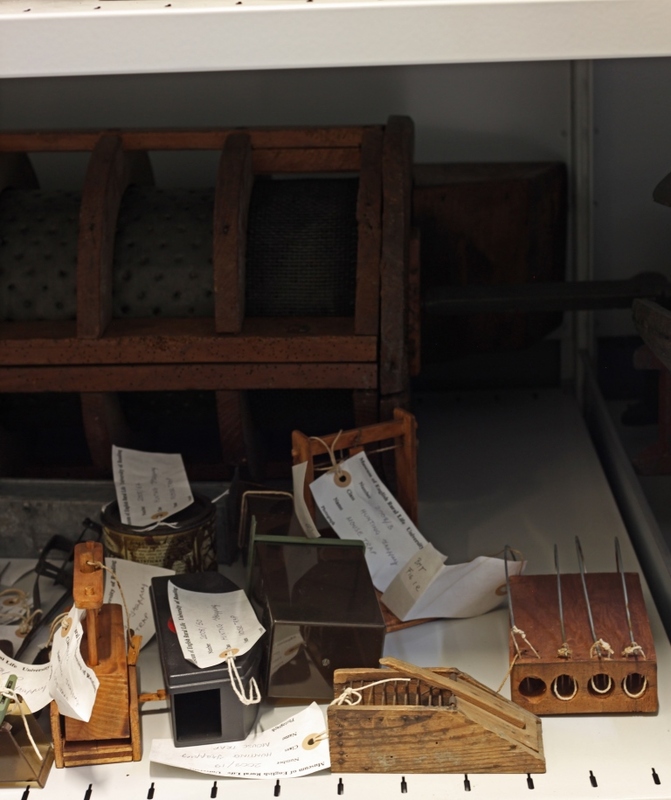 And while our most vulnerable objects have always been cased – such as clothing and leather – the rest of our stored collection made of sturdier wood and metal was only fully glazed over last year. 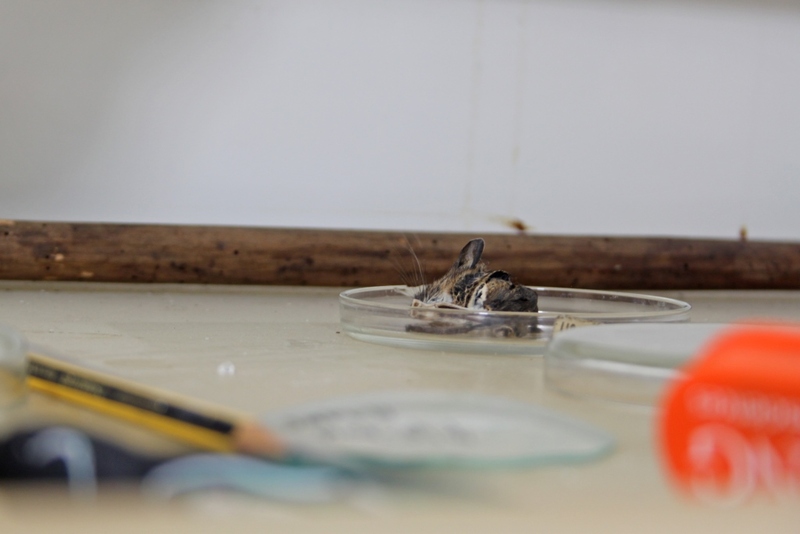 This mouse may have snuck into the trap before this glazing, or otherwise managed to get in while construction work has been carried out for the Museum’s redevelopment. We have traps set for pests, but we can never catch everything all of the time. This mouse managed to sign its own death warrant before it could do any more damage, the extent of which was only a nibbled label. We will also have to determine whether this mouse was a scout or part of a larger family. Luckily, because the collection is heavily used it is often only a matter of time before any kind of infestation is noticed and nipped in the bud. This mouse was found when our Assistant Curator was in the Stores selecting objects for use in an interdisciplinary research session on the subject of ‘Animals at Reading’. 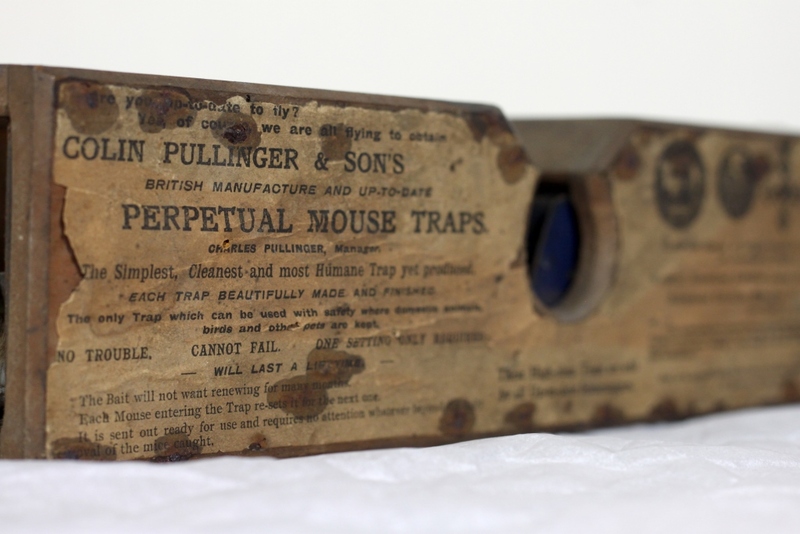 Our current MERL Fellow, Professor Karen Sayer, is also particularly interested in traps as part of her ongoing research into rats and pest control and regularly views our collection. The other end of the trap, sans mouse. For the moment, however, the mouse remains in the trap while we decide what to do with it. One option is a dignified burial, another is to desiccate it or have it prepared to remain as a permanent feature of the mouse trap for our new displays. We’ll let you know what we decide.